See the Norfork Lake website for additional information. Primary recreational opportunities are listed below. Directions: From Little Rock, 135 miles north on US 65, 50 miles east on US 62. Factoid: Norfork Lake provides both open breezy stretches for sailing and quiet, secluded coves which are ideal for water sports. Undeveloped shoreline allows for ample room to enjoy the hills and hollows. Public lands around Norfork provide hunters with a wide variety of opportunities. Parks offer campsites ranging from rustic to modern. Marinas provide boat rental and related supplies and services. 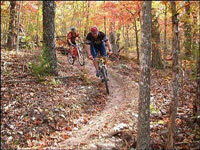 Hiking trails enable nature observers and photographers to view the Ozark Mountains through the change of seasons.